In this study, we show that IFN-αβ can have a direct role in linking innate and adaptive responses by providing the “third signal” needed by naive CD8 T cells responding to Ag and costimulatory ligands. Stimulation of CD8 T cells in the absence of a third signal leads to proliferation, but clonal expansion is limited by poor survival and effector functions do not develop. We show that IFN-αβ can provide the third signal directly to CD8 T cells via a STAT4-dependent pathway to stimulate survival, development of cytolytic function, and production of IFN-γ. Provision of the third signal by either IFN-αβ or IL-12 results in regulation of the expression of a number of genes, including several that encode proteins critical for effector function. Type I IFNs (IFN-αβ) are produced by most cells upon viral infection, have potent antiviral activities, and can provide therapy for some malignancies and immune disorders. Mechanisms mediating these effects remain poorly defined, but there is growing appreciation for IFN-αβ having immune regulatory functions including stimulation of IFN-γ production by CD4 T cells (1), and effects on Ag-presenting dendritic cells (DC) 4 (2, 3). IFN-αβ can promote CD8 T cell responses, but these effects are usually interpreted as being indirect, i.e., resulting from IFN-αβ acting on another cell type such as CD4 Th cells or DC. For example, IFN-α stimulates proliferation of memory CD8 T cells (4) by inducing IL-15, which then acts on the T cells (5). IFN-αβ also stimulates maturation of DC (2) and their ability to cross-prime CD8 T cells (3). Some evidence does, however, suggest direct effects on CD8 T cells. IFN-αβ promotes IFN-γ production by the cells in a STAT4-dependent manner (1) and promotes survival of CD8 T cells from wild-type but not type I IFN-αβR-deficient mice (6). As demonstrated in this study, IFN-αβ can, in fact, act directly on naive CD8 T cells and have a profound role in determining the outcome of interaction with Ag. T cell activation requires Ag (signal 1) and costimulation (signal 2) provided through CD28-B7 interaction (7), but these are not sufficient to fully activate naive CD8 T cells. This became apparent when purified TCR-transgenic CD8 T cells were examined using artificial APCs: microspheres bearing MHC class I/peptide Ag and B7-1 ligand. Memory cells clonally expanded and developed effector function in response to this stimulus, whereas naive cells did not. Naive cells required, in addition, a third signal that could be provided by IL-12 (8). A similar requirement has been demonstrated in vivo (9), and the “third signal” acts as a switch that determines whether exposure to Ag results in tolerance vs full activation and development of memory (10, 11). IL-12 cannot be the only source of signal 3 since CTL responses can occur in IL-12-deficient mice (9, 12). As shown in this study, type I IFN can also provide the third signal for clonal expansion and differentiation of naive CD8 T cells and does so by acting directly on the T cell. OT-I mice (13) were crossed with Thy-1-congenic B6.PL-Thy1a/Cy (Thy1.1) mice and bred to homozygosity. IFNAR−/− mice (14) on the C57BL/6 background were a gift from Dr. J. Sprent (The Scripps Research Institute, La Jolla, CA) and were bred to OT-I mice (OT-I/IFNAR−/−). Breeding colonies were maintained under specific pathogen-free conditions at the University of Minnesota (Minneapolis, MN). C57BL/6NCr mice were obtained from the National Cancer Institute. BALB/c and STAT4-deficient (STAT4−/−) mice were purchased from The Jackson Laboratory. Anti-human granzyme B Ab (PE) was obtained from Caltag Laboratories and all other fluorescent Abs were purchased from BD Pharmingen or eBioscience. Neutralizing polyclonal sheep anti-IL-12 Ab and anti-mouse IFN-α Ab were obtained from Genetics Institute (Cambridge, MA) and PBL Biomedical Laboratories, respectively. CD8+CD44low naive cells were enriched from lymph node cells by negative selection using MACS magnetic cell sorting (Miltenyi Biotec) (11) and were >95% CD8+ and <0.5% CD44high. For preparation of artificial APC, 5-μm microspheres were coated with DimerX H-2Kb:Ig (BD Pharmingen) at 2.5 μg/107 beads and pulsed with 0.1 μM OVA257–264 peptide; B7-1/Fc(0.15 μg/107) or ICAM-1/Fc (0.5 μg/107) chimera proteins (R&D Systems) were coimmobilized where indicated (11). In brief, 5 × 104 purified naive CD8 T cells and 2 × 105 artificial APC were placed in flat-bottom microtiter wells in 200 μl of RP-10. Human rIL-2 at 2.5 U/ml (TECIN; NCI Biological Resources Branch), murine rIL-12 at 2 U/ml (Genetics Institute), and Universal type I IFN or murine IFN-α at 1000 U/ml (PBL Biomedical Laboratories) were added as indicated. Cell recovery was determined after 3 days of culture. Cytolytic activity was determined in a standard 4-h 51Cr release assay using E.G7 cells as targets. Triplicate measurements were done in all assays, and values varied by <10%. For intracellular staining for IFN-γ, cells were harvested at 48 h, with addition of 0.6 μl/ml GolgiStop (BD Pharmingen) for the last 4 h of culture. Cells were washed, fixed, permeabilized, and stained with allophycocyanin-conjugated anti-IFN-γ Ab and analyzed by flow cytometry as previously described (11). PCR for cDNA amplification (95°C/10 min + 30 cycles = 95°C/1.5 min, 63°C/2 min, 72°C/3 min) was done using specific primers for perforin, granzyme B, GAPDH, and β-actin designed using Primer3 software. For microarray analysis, total RNA was purified and biotin-labeled transcripts were prepared from 10 μg of RNA according to the manufacturer’s protocol for hybridization onto Affymetrix MG U74Av2 chips. Chips were probed, hybridized, and scanned at the University of Minnesota Biomedical Genomics Center Facility. Triplicate arrays were done for naive (0 h) and 48-h RNA samples obtained from independent experiments, and single arrays were done for 24- and 72-h samples. Signal log ratios were generated between samples being compared (MAS comparison analysis) and fold change) was calculated as fold change = 2^ signal log ratios. Significant differentially expressed genes were sorted that expressed an average fold change >1.7 and a change p value ≤0.05. We screened a panel of cytokines for their ability to support responses by highly purified naive TCR-transgenic OT-I CD8 T cells (13) stimulated with microspheres having H-2Kb/OVA257–264 Ag and B7-1 on the surface (11), thus minimizing potential effects of the cytokines on APC or other cells. Cytokines tested included IL-1, -2, -4, -6, -7, -12, -15, and -18; TNF-α, IFN-γ, and IFN- α (data not shown); and only IL-12 and IFN-α were effective. IFN-α stimulated increased clonal expansion of naive OT-I cells responding to Ag and B7-1 (Ag/B7) to a level comparable to that stimulated by IL-12 (Fig. 1⇓a), and the combination was no more effective than either alone. The extent of cell division as measured by CFSE dye dilution was comparable for cells stimulated with Ag/B7 alone or along with either cytokine (data not shown). Thus, IFN-α promotes survival to allow clonal expansion. IFN-α provides a third signal for CD8 T cell clonal expansion, development of cytolytic function, and IFN-γ production when costimulation is provided by B7-1 or ICAM-1. Naive OT-I T cells were stimulated with Ag-bearing microspheres and either coimmobilized B7-1 (a–c) or coimmobilized ICAM-I (d and e) with the indicated cytokines. Clonal expansion on day 3 is expressed as fold increase in cell number (a and d). Similar results were obtained in more than three independent experiments in each case. Cytolytic activity was measured by 51Cr release from E.G7 targets (b and e). IFN-γ production was measured by intracellular staining of cells stimulated for 48 h with Ag/B7-1 microspheres and the indicated cytokines. IFN-α also supported development of cytolytic activity (Fig. 1⇑b), and the combination of IFN-α and IL-12 showed a small but reproducible increased effectiveness. Induction of IFN-γ production also required a third signal that could be provided by either IFN-α or IL-12 (Fig. 1⇑c). Stimulation with Ag and B7-1 resulted in very few IFN- γ-producing cells. Addition of either IFN-α or IL-12 increased the number of IFN-γ-producing cells, although IFN-α was not as effective as IL-12. The effects of IFN-β were comparable to those shown for IFN-α (data not shown). LFA-1/ICAM-1 can also provide costimulation for CD8 T cells (15), and IFN-α was able to provide the third signal when ICAM-I was coimmobilized with Ag (Fig. 1⇑, d and e). ICAM-1 is expressed on many cell types, raising the possibility that cells that produce IFN-αβ upon virus infection may have the capacity to effectively present Ag to initiate a CTL response. These experiments using highly purified naive CD8 T cells strongly suggested that IFN-αβ acts directly on the T cell, but the possibility existed that a small number of contaminating APC might acquire peptide from the artificial APC and be stimulated by IFN-αβ to become potent stimulators. To address this, we examined responses by OT-I CD8 T cells deficient for the IFN-αβ receptor (OT-I/IFNAR−/−). In contrast to OT-I cells, OT-I/IFNAR−/− cells stimulated with Ag/B7 and IFN-α had only a background level of cytolytic activity (Fig. 2⇓a). Failure of the OT-I/IFNAR−/− cells to respond to IFN-α did not conclusively demonstrate that IFN-α acts directly on the CD8 T cells and not on contaminating APC, since cells such as DC that might be present in the purified T cell population would also lack the type I IFNR. To address this, mixing experiments were done in which equal numbers of purified wild-type OT-I and OT-I/IFNAR−/− cells congenic at the Thy1 locus were placed in culture and stimulated with Ag/B7 and IFN-α. If IFN-α acts indirectly on APC, then OT-I/IFNAR−/− cells should be activated under these conditions since APC expressing the IFNR are present. After 3 days, the mixed population exhibited potent cytolytic activity in response to IFN-α, but not in its absence (Fig. 2⇓b). When wild-type OT-I and OT-I/IFNAR−/− cells were stimulated together in the presence of IFN-α and then isolated based on Thy1.1 expression and independently assayed for cytolytic activity, OT-I cells had potent cytolytic activity, while the OT-I/IFNAR−/− cells had only background activity (Fig. 2⇓b). Thus, IFN-α must act directly on the CD8 T cells to stimulate development of effector function. IFN-α acts directly on CD8 T cells and signals via a STAT4-dependent pathway. a, OT-I and OT-I/IFNAR−/− cells were stimulated with Ag/B7 with or without IFN-α and cytolytic activity was determined. b, OT-I and OT-I/IFNAR−/− cells were mixed in equal numbers and stimulated for 3 days with Ag/B7 with or without IFN-α. Cytolytic activity was then determined for unseparated cells or for OT-I or OT-I/IFNAR−/− purified from the mixed cultures. c and d, OT-I and OT-I/IFNAR−/− cells were stimulated with Ag/B7 with or without IL-12 and cytolytic activity was determined. d, Cytolytic activity is expressed as lytic units as a function of the dose of IL-12. 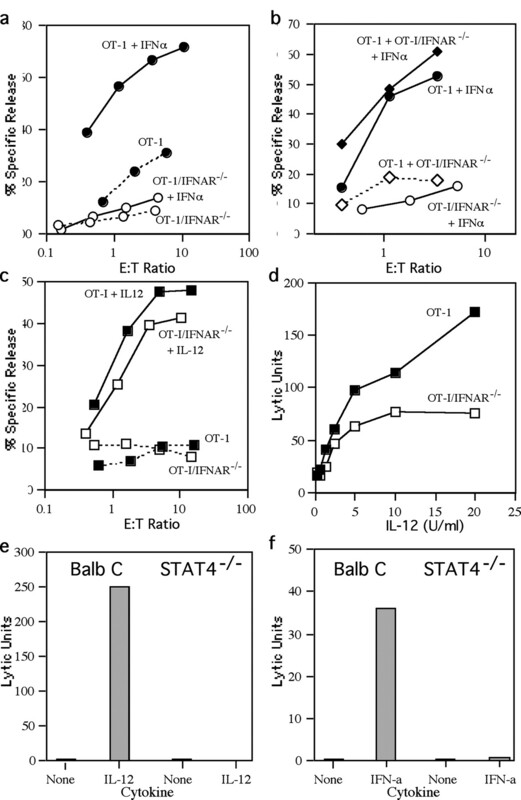 e and f, Naive CD8 T cells from BALB/c or STAT4−/− mice were stimulated with anti-TCR mAb and B7-1 on microspheres with or without IL-12 (e) or IFN-α (f) and cytolytic activity (expressed as lytic units) determined in a redirected lysis assay using 2C11 hybridoma targets. The OT-I/IFNAR−/− cells did develop cytolytic activity in response to IL-12 but this was somewhat attenuated in comparison to wild-type cells (Fig. 2⇑c), and this was the seen over a broad IL-12 concentration range (Fig. 2⇑d). Taniguchi and coworkers (16) have shown that signaling by IL-6 and IFN-γ receptors is attenuated in cells deficient in the type I IFNAR because the IFNR is needed to provide a docking site for efficient STAT dimerization, and they suggested that similar cross-talk may affect activation of STAT 4 by IL-12. Nevertheless, the attenuated response to IL-12 (Fig. 2⇑, c and d) raised the possibility that it might act, at least in part, by stimulating production of IFN-αβ which then signals the T cells. However, neutralizing anti-IL-12 Ab eliminated the response to IL-12 but not to IFN-α and neutralizing anti-IFN-αβ Ab blocked the response to IFN-α but not to IL-12 (data not shown). Thus, these cytokines can independently provide signal 3 to CD8 T cells. 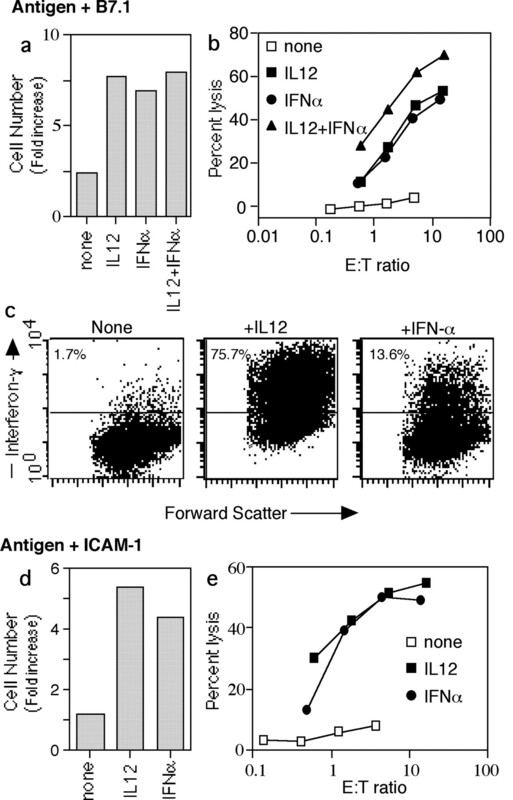 CD4 T cell activation by either IL-12 or type I IFN to produce IFN-γ depends on STAT4 (1). We therefore examined responses of naive CD8 T cells from STAT4−/− mice and wild-type BALB/c controls. Cells were stimulated using anti-TCR mAbs (anti-Vβ5 and anti-Vβ8 mAbs) and B7-1 on microspheres, and cytolytic activity was determined in a redirected lysis assay using 2C11 hybridoma targets, where killing is mediated via the anti-CD3 mAb expressed by the hybridoma (17). Stimulation of naive CD8 T cells from BALB/c in the presence of either IL-12 or IFN-α resulted in development of cytolytic activity, while cells from STAT4−/− mice proliferated equally well (data not shown), but developed almost no cytolytic activity (Fig. 2⇑, e and f). In addition, BALB/c cells produced IFN-γ following stimulation in the presence of the cytokines, whereas STAT4−/− cells did not (data not shown). The ability of IL-12 or IFN-α to support clonal expansion and development of effector functions suggests that they initiate programs of gene expression unique from those initiated by Ag and costimulation. To begin to assess this, gene expression patterns were compared for naive CD8 T cells vs cells stimulated with Ag/B7 alone or along with IL-12 or IFN-α (using oligonucleotide microarrays having 12,489 murine genes and expressed sequence tags). When compared with naive cells, Ag/B7 stimulation for 48 h resulted in increased mRNA expression of >1,500 genes (1.7-fold or greater) and decreased expression of a similar number. With IL-12 present, expression levels of ∼212 genes changed, while IFN-α caused a change in ∼117, in comparison to cells stimulated with just Ag/B7 (complete results of the oligonucleotide microarray analysis will be published elsewhere). IFN-α and IL-12 appeared to regulate a number of genes in common, including those for several proteins that are involved in CTL effector function, and these were examined in more detail. IL-12 needs to be present from ∼15–60 h after stimulation with Ag/B7 for maximal response and development of effector function by 72 h, the peak of cytolytic activity (18), and we therefore examined mRNA expression at 24, 48, and 72 h (Fig. 3⇓.) Expression of mRNA for granzyme B (Fig. 3⇓a) and perforin (Fig. 3⇓b) was up-regulated by both IL-12 and IFN-α. Granzyme C was also up-regulated, but only in response to IL-12 (Fig. 3⇓c). Expression of mRNA for Fas ligand, which mediates Fas-dependent killing of targets by CTL, was up-regulated by both cytokines (Fig. 3⇓d), as was IFN-γ mRNA expression (data not shown). IFN-α and IL-12 up-regulate mRNA expression for proteins involved in CTL effector function. Naive OT-I cells were stimulated with Ag/B7 with or without IFN-α or IL-12, harvested at the indicated times and mRNA isolated. Oligonucleotide array analysis was done to determine mRNA expression levels for the indicated proteins, and the results are expressed as fold change in comparison to mRNA isolated from naive cells. Measurements at 48 h were done in three independent experiments and the average and SD is shown. Other time points represent single experiments. Perforin and granzyme B are essential components of the degranulation mechanism of cytolysis, the major pathway for CTL killing of virus-infected cells and tumor cells, and we examined these in more detail. Semiquantitative RT-PCR confirmed the mRNA expression pattern (Fig. 4⇓a) and time course (data not shown) seen by microarray analysis for these genes. These results were further confirmed at the protein level by intracellular staining. When OT-I cells were stimulated with Ag/B7 for 72 h in the presence or absence of IL-12, levels of perforin expression differed by only about 2-fold (data not shown), not as great a difference as is seen at the level of mRNA expression. In contrast, levels of granzyme B expression were increased one to two orders of magnitude in response to either IL-12 or IFN-α (Fig. 4⇓b), and this correlated with the level of cytolytic activity of the cells (data not shown). Thus, up-regulation of granzyme B expression appears to be one of the mechanisms by which signal 3 cytokines confer cytolytic function on the CD8 T cells, and increased expression of perforin may make some contribution. 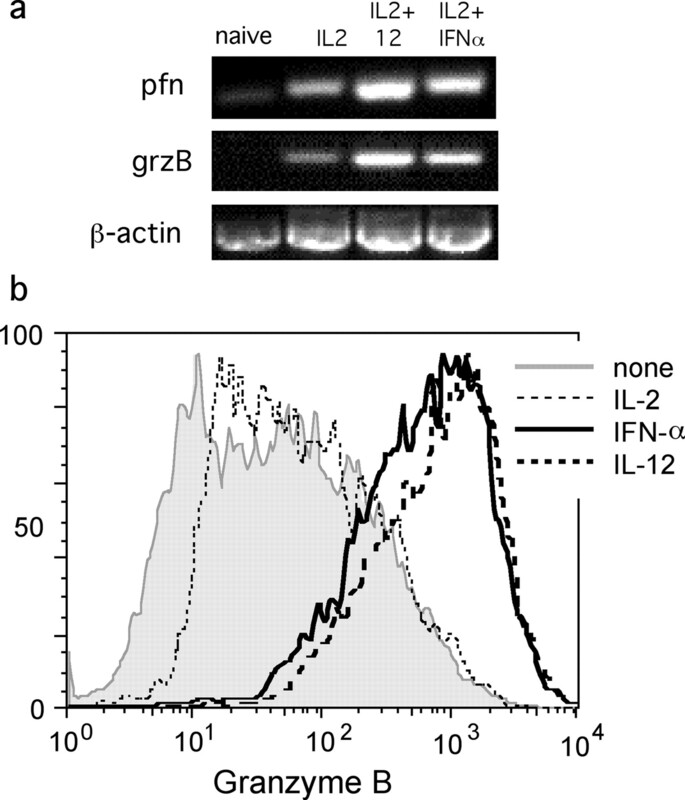 IFN-α and IL-12 up-regulate perforin and granzyme B mRNA and protein expression. a, Naive OT-I cells were stimulated with 2C11 anti-CD3 mAb and B7-1 immobilized on microspheres, with IL-2 and with or without IL-12 added. 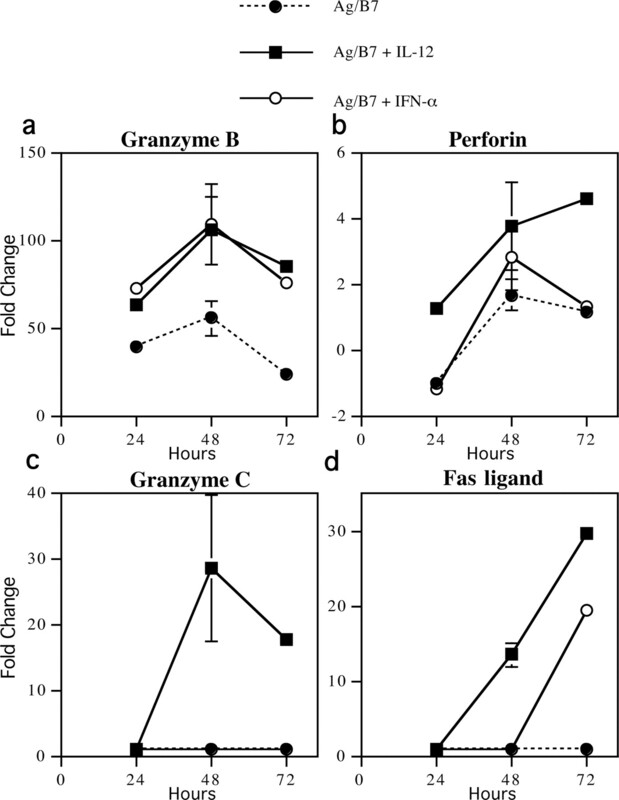 Semiquantitative RT-PCR was used to determine perforin (pfn), granzyme B (grzB), and β-actin mRNA levels at 72 h. b, Naive OT-I cells were stimulated for 72 h with Ag/B7, with or without IL-2, IFN-α, or IL-12, and granzyme B levels were determined by intracellular staining and flow cytometry. These results demonstrate that IFN-αβ, like IL-12, can signal directly to naive CD8 T cells via a STAT4-dependent pathway to provide the third signal that is needed to initiate the differentiation program required for survival (and thus clonal expansion) and development of effector functions. Both cytokines up-regulate expression of several proteins essential for development of effector function (Figs. 3⇑ and 4⇑). Preliminary results from oligonucleotide microarray analysis also suggest that the programs initiated by these two cytokines are not identical; granzyme C, whose physiological functions are not yet well defined (19), appears to be up-regulated by IL-12 but not IFN-α (Fig. 3⇑c), and there are differences in regulation of the expression of genes encoding for several proteins involved in lymphocyte trafficking (data not shown). Thus, even though either IL-12 or IFN-αβ can stimulate generation of effector CTL, the resulting effector populations may differ with respect to some functional and migration properties. This previously unappreciated role of IFN-αβ is likely to be an important mechanism that contributes in many instances to its therapeutic effects in viral diseases and tumors, and raises the possibility of its use as an effective adjuvant for inducing specific CD8 T cell responses to virus and tumor Ags for protective immunization and immunotherapy. It is likely that IFN-α also plays a role in the activation of naive CD8 T cells by activated DC in response to infections and tumors. The CD8α+ subset of murine DC that most effectively presents Ag to CD8 T cells by cross-priming (20) can produce IL-12 and IFN-α in response to activating stimuli such as TLR ligands (21, 22). Thus, the CD8α+ DC subset effectively presents Ag on class I MHC proteins and produces the cytokines that can provide the third signal to activate naive CD8 T cells, and these same cytokines can shape the CD4 T cell response by skewing toward a Th1 response to further ensure strong cell-mediated immunity. Conversely, the CD8α+ subset of DC can also tolerize CD8 T cells by cross-priming (23), and this may occur when the DC are not activated to produce IL-12 and/or IFN-α, and thus fail to provide the required third signal. ↵1 This work was supported by National Institutes of Health Grants RO1 AI34824 and PO1 AI35296 (to M.F.M.). Nguyen, K. B., W. T. Watford, R. Salomon, S. R. Hofmann, G. C. Pien, A. Morinobu, M. Gadina, J. J. O’Shea, C. A. Biron. 2002. Critical role for STAT4 activation by type 1 interferons in the interferon-γ response to viral infection. Science 297:2063. Le Bon, A., N. Etchart, C. Rossmann, M. Ashton, S. Hou, D. Gewert, P. Borrow, D. F. Tough. 2003. Cross-priming of CD8+ T cells stimulated by virus-induced type I interferon. Nat. Immunol. 4:1009. Tough, D. F., P. Borrow, J. Sprent. 1996. Induction of bystander T cell proliferation by viruses and type I interferon in vivo. Science 272:1947. Jenkins, M. K., J. G. Johnson. 1993. Molecules involved in T-cell costimulation. Curr. Opin. Immunol. 5:361. Curtsinger, J. M., D. C. Lins, M. F. Mescher. 2003. Signal three determines tolerance versus full activation of naïve CD8 T cells: dissociating proliferation and development of effector function. J. Exp. Med. 197:1141. Magram, J., S. E. Connaughton, R. R. Warrier, D. M. Carvajal, C.-Y. Wu, J. Ferrante, C. Steward, U. Sarmiento, D. A. Faherty, M. A. Gately. 1996. IL-12-deficient mice are defective in IFNγ production and type 1 cytokine responses. Immunity 4:471. Mitani, Y., A. Takaoka, S. H. Kim, Y. Kato, T. Yokochi, N. Tanaka, T. Taniguchi. 2001. Cross talk of the interferon-α,β signaling complex with gp130 for effective interleukin-6 signaling. Genes Cells 6:631. Leo, O., M. Foo, D. Sachs, L. Samelson, J. Bluestone. 1987. Identification of a monoclonal antibody specific for murine T3. Proc. Natl. Acad. Sci. USA 84:1374. Curtsinger, J. M., C. M. Johnson, M. F. Mescher. 2003. CD8 T cell clonal expansion and development of effector function require prolonged exposure to antigen, costimulation, and signal 3 cytokine. J. Immunol. 171:5165. Lieberman, J.. 2003. The ABCs of granule-mediated cytotoxicity: new weapons in the arsenal. Nat. Rev. Immunol. 3:361.